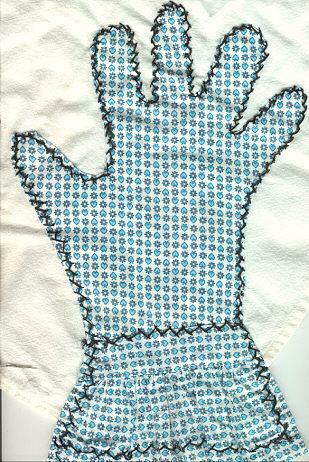 Handstitched Glove in a Dusting Cloth. Blue pattern cotton with black stitching. Glove has ruffled cuff. Hand is 12" long. Cloth is 16 1/4" x 18 1/4". Very good condition, no stains or tears. Does not look like it was ever used. Items Similar To "Dusting Cloth with Handstitched Glove"